One year later: Sage Murnane holds new addition, Tess, while (left to right) Molly, Jack and Gracie hold “Daddy Dolls” made to look like their father, Michael, who is serving in Afghanistan. 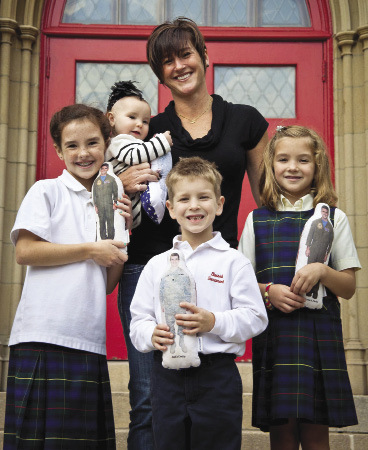 When Pillars magazine featured Sage Murnane and her children on its cover in 2011, her husband Michael was serving in the military, while they had found a home within the community at Blessed Sacrament School. Now, almost a year later, the children are still happy at Blessed Sacrament, and Michael is still serving his country. But, there are some new developments in the Murnane household, too. 2011. Her arrival was a planned Cesarean section, which meant that Michael was able to be there. He came home again to see Tess baptized but is now serving in Kandahar, Afghanistan. “So, he’s only seen her for less than two weeks, and she’s 7-months old,” Murnane said. Of course, there are times when the children realize that they are not all together. Murnane said the children miss their father every day, especially on special occasions like when they are blowing out their birthday candles. It’s for this reason that Sage started a campaign called Heroes at Home to help the children of other soldiers in her husband’s unit feel as if their parents aren’t so far away. or her own Daddy Doll with Michael’s smiling photo pasted on the body. Now the family and the students at Blessed Sacrament are helping to make Daddy Dolls for other children, as well, sending them off in boxes filled with handmade birthday cards from the students. According to Murnane, the teachers and parents have been incredibly supportive, and women at the school help sew the dolls together. Sacrament School at (315) 463-1261.